It is possible to share content from your site and make it usable by other Mosaic sites. The process of setting up content sharing is instigated on the site providing content, who determines which site(s) can consume content and which content is available for sharing. The administrators of the consuming site(s) can opt to use/not use the content that has been made available to it. When Content Sharing is set up between two sites, the content will be rendered on the consuming site in the branding set by the consuming site's theme. 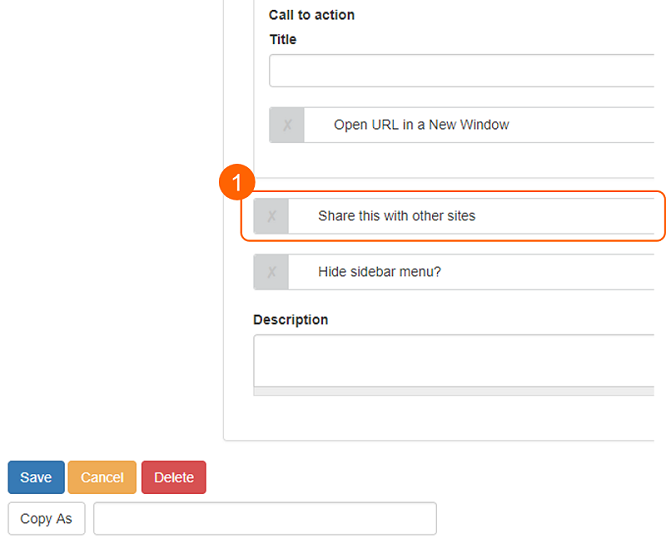 To set up content sharing, select the site(s) that will be able to use content from your site in the input field on the Content Sharing tab. Select the sites that can use your content from the dropdown list or by typing the name of a site into the input field. Once the site(s) have been chosen, save the settings. Once sites have been selected to be able to use content from your site, a checkbox (1) will be visible on the Details tab in each page's edit mode. This provides you with the option to make the content available to sites you have selected on the Content sharing tab in Site Settings. Once the above steps have been completed on the providing site, the shared content will be visible in the list on the consuming site's Manage Content > Shared content screen. On this screen, all content which other sites have made available for use on your site is visible. To use a piece of shared content on your site, click 'Add to site'. Once this is done, it will appear in the main content list (Manage Content > Content screen). Once added to a consuming site, shared content can be displayed using listing widgets, linked to, and a navigation link can be created for the content. Once shared content has been added to the consuming site. The content will appear in the Content screen in Manage Content. For comparison, the screenshot below displays information about a shared profile page under the information about a profile page which belongs to the site. When shared content is displayed in the Content list, the 'Shared from' information displays the name of the owning site, the operations buttons do not display, and a 'Contact information' is displayed. Clicking the 'Contact information' button opens a modal to display information about the owning site and user who last updated the content. To remove a piece of shared content from a site, click 'Remove from site'. To use a piece of shared content, the consuming site must possess the same content sub-type that the piece of shared content belongs to. If the sub-type is not on the consuming site, a message will be displayed in place of the 'Add to site' button on the Shared content screen. In the example below, the 'Press release' sub-type is not present on the consuming site so the 'Announcement about mosaic making' content has been flagged as not usable. To use the piece of shared content, the site owner/administrator needs go to Site Settings > Content types and add 'Press release' as a sub-type of the 'Article' content type. Once this is done, the Shared content screen can be reloaded and the 'Add to site' button will appear. If a piece of shared content has a taxonomy term associated with it, and the consuming site wants the content to be discoverable using the taxonomy term (e.g. using taxonomy filters above a filtered listing), the consuming site must include the taxonomy the term belongs to. Example: the shared 'Mosaic making class' in the screenshot above possess the taxonomy term 'All ages', which belongs to the taxonomy 'Age group'. In order for the 'All ages' term to be used on the consuming site, the taxonomy 'Age group' must be created on it. Once this is done and the content is added to the consuming site, the term 'All ages' will automatically be added to the 'Age group' taxonomy. The taxonomy must be created on the consuming site before the shared content is added to the site for this to work.